Provide your full name and the name of the clinic/hospital you currently work at when you register. Wanchai Animal Hospital is pleased to announce a lecture with Sr. Tania Serfontein exclusively for veterinary nurses. In this lecture, Tania will discuss practical theory and tips for general anaesthesia in daily practice. Sr. Tania Serfontein started her studies in 2000 with a BSc: Zoology at the University of Pretoria. Graduated in 2002. Went on to Diploma in Veterinary Nursing in 2003 in which she qualified in 2004 receiving her diploma with distinction. Received the prize for the best student in Anaesthesiology. She worked at Fourways Veterinary Hospital (Specialist Referral Practise) where she started as a general medicine nurse where her duties included general practice nursing and procedures (dentals, tumour removals, radiography, bandages and treatment of patients). She progressively moved to specialist medicine nurse (assisted in endoscopy, ultrasound, nursed patients with more complicated conditions, administered chemotherapeutic agents). She functioned as the anaesthesiology and ICU nurse of the practice. She has a keen interest in both anaesthesiology and critical care. Daily duties included: premedication of all animals requiring an anaesthetic, booking of anaesthetic procedures, MRI anaesthetic monitoring, monitoring of geriatric and complicated anaesthetic procedures, management (placement and maintenance of central lines, feeding tubes, urinary catheters, blood pressure, capnography, pulse oximetry, blood gas analysis, nutrition) and monitoring of any critically ill patients requiring intensive care and/or advanced life support. Her responsibilities included maintenance of the surgical/anaesthetic equipment and monitors as well as ordering of stock for theatre. She worked in the Onderstepoort Veterinary Academic Hospital in Theatre in the position of Senior Veterinary Sister Anaesthesiology from 1 April 2010 where her duties included clinic management and maintenance of equipment, training of students and general anaesthesia. 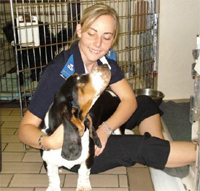 She returned to Bryanston Veterinary Hospital from December 2010 and resumed her previous duties and scope of practice. As of January 2014 up until October 2014, she worked with Dr. Kenneth Joubert for Veterinary Anaesthesia, Analgesia and Critical Care services on a part-time basis, in offering an anaesthesia and ICU service in the greater Johannesburg area. Currently she is employed at Fourways Veterinary Hospital where her primary duties include anaesthesia and critical care. She has gained experience in the field of nursing and critical care through managing patients with various conditions, levels of care and through further reading. She is competent in the management of ventilated patients. She furthers her knowledge of both the fields of anaesthesia and critical care by attending tveterinary critical care group meetings, various intensive care and anaesthesiology congresses, and has completed the Anaesthesiology 700 course through the University of Pretoria. She is passionate about education of nurses and have presented various lectures on different aspects of ICU care and Anaesthesia.